The South Dakota Music Teachers Association invites all composers living in the state of South Dakota to submit an intermediate level piece for cello and piano. The piece can be a single-movement work, or multi-movement work such as a suite, sonata, or sonatina. It shall be six to ten minutes in length. Compositions shall be submitted by May 5, 2018 for consideration. The winning composer will receive an honorarium of $900 to be paid by SDMTA and MTNA and his/her composition will be performed at the SDMTA Annual Conference and Competitions in November 2018 and submitted to Music Teachers National Association for consideration for the National Distinguished Composer of the Year. 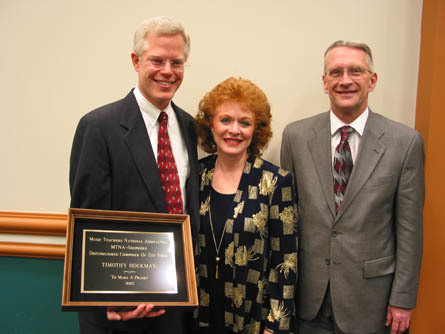 In 2002, our commissioned composer, Timothy Hoekman, was selected to receive the MTNA-Shepherd Distinguished Composer of the Year for his composition To Make a Prairie for soprano and piano. To Make a Prairie is based on four poems by Emily Dickinson: To Make a Prairie, She Sweeps with Many-Colored Brooms, It Sifts From Leaden Sieves, and Two Butterflies Went Out at Noon.